Travel with your Pet to Taos, New Mexico! 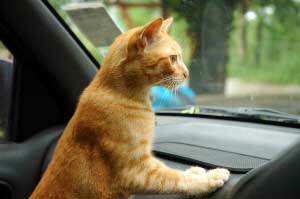 Travel with Cats and Dogs by Car (cont.) ! It is important to carry a travel kit for your pet. The kit should contain grooming essentials, vital medications, vaccination record and other health records. You should also carry food and water plus food bowls to feed your pet. Apart from these, you should carry, litter boxes, poop scooper, an extra leash and collar. It is advisable to also carry your pets favorite toy and some treats as well. Carriers are the best way to travel with cats. Some will settle down after awhile, some won't. You may want to use a light sedative such as Rescue Remedy - clear it with your vet beforehand. Make certain you have a kitty box, food and water. Usually cats will hold it until you take a break. You could also have harnesses and leashes so the cats could get out and stretch their legs and sniff. Take the carriers into her with doors were left open so they can use the kitty box if they need to. Keep water available during the ride. Feed before leaving in the morning and again at night. Keep the direct sun off of them. When stopping always park under a nice big shade tree if it is hot. Most pets might fall asleep during the journey. But some pets can get restless. Therefore it is important that you keep them entertained. It may seem fun to let your pet hang out its head out the window, but this is quite dangerous lest he jumps off the moving vehicle. Also the blowing wind isn't good for the ears and lungs. Instead carry some toys, treats and other objects that will keep your furry pet entertained. Stop the car in between, and take your pet for a walk (on a leash, obviously). It is important that you stop often to let your pet stretch its legs. But always remember to keep your pet on a leash when stepping out of the car. You don't want your pet running around and scaring people. You have to stop to feed your pet at regular intervals. Feeding your pet in a moving vehicle is a strict no no. After feeding your pet, give it some time to digest to prevent your pet from motion sickness. Before starting your trip, feed your pet 3-4 hrs ahead of time. For your pets safety, let your pet sit in the backseat to prevent it from getting injured in case of an accident. Get a restraint system installed in the car. You can get one depending on the size and breed of your pet. There are many options to choose from. But remember to choose a restraint system that allows your pet to move and turn in the seat. Bring a cheap towel to place open kiit carrier and litter box on, or as a doggy bed.